Mike Kirby won the Peterborough & District AA match. Peterborough and District AA members were really looking forward to fishing the River Nene at Stibbington after a week of very good weights taken from that stretch of the river. However, with the flow easing off and the colour starting to drop out, it proved to be a tough, but very rewarding day. The big fish refused to feed but most did manage to catch. Top rod was Mike Kirby, a seasoned river angler who put all his knowledge of the Nene to good use putting 5lb 4oz to the scales taken on the pole with pinkie and maggot over groundbait. Runner-up was Nathan Minter with 2lb 13oz followed by Reg Molesworth on 1lb 14oz. It’s so good to see matches on the Nene and Mike Smith is to be applauded for running them. Let’s hope once conditions are right even more Peterborough anglers will once again get back onto the river. On the Whittlesey Twenty Foot Drain, the hot pegs at Beggars Bridge fished well for those Whittlesey AA anglers lining the bank last Saturday. Once again dominating affairs was John Taylor. He drew close to the bridge and put a fine 15lb of roach, perch and skimmers to the scales. Second was Dave White on 12lb 4oz then came Richard Linnell and Mark Barron, both with 10lb 8oz. Ramsey & District Angling Society held their latest club match on the usually reliable Factory Bank, but even this venue succumbed to the bitterly cold weather. Anglers at the draw saw the venue covered in ice and with the water gin-clear it was always going to be a tall order to find the fish. Jim Broadbent took the honours from peg nine with a modest 2lb 5oz taken on maggot fished up to the ice. Keith Rayment caught a few tiny perch to take second place with 3oz, then came Malc Hobbs with 1 1/2oz. A week of heavy frosts leading up to the Saturday Open meant the boat had to be called into action to break the ice at Rookery Waters. 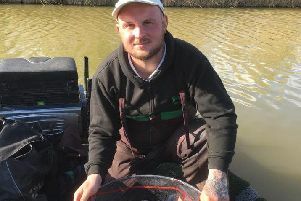 Winner on the day was St Neots based angler Ricky Ashwell from peg 35. He started on bread fished shallow in open water to catch carp up to 3lb for a hard-earned 55lb 8oz. Runner up was Bob Coulson (31lb 8oz) and third Tony McGregor (16lb 10oz).